* ... MEMORY LANE: My mailbox has been full with notes from readers about a walk down memory lane. Today's blog is a tribute to just that. Enjoy. * .. THE BLUFFS: Supervisor Mike Maggard wrote to talk about the early days of Panorama Drive and the bluffs, so he turned to his mother Neta to remind him of a story told by his late father Bill. "Around 1951-1952, there used to be an air strip along the bluffs near the cemetery. Mom remembers the gas station at the corner of River Boulevard, and the liquor store next to it to the east, but few if any homes were in the area. No bar, as far as she recollects. Anyway, the airstrip was used by 'brave' young east side car enthusiasts to stage drag races. My father raced there often and when he began courting my mother during her senior year of high school, she would hop into the front seat of his “flat head ’40 Ford” with him and they would drag race up the runway. 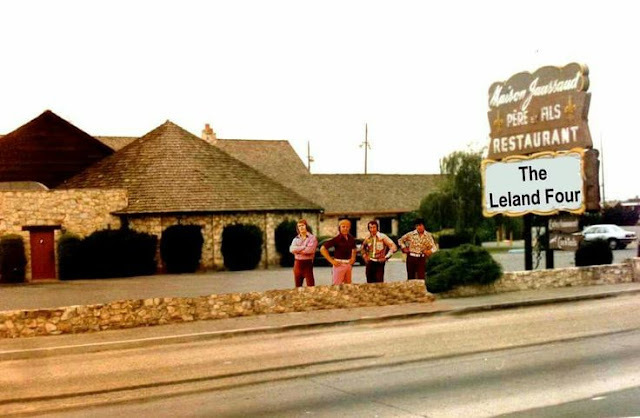 When he and his buddies, who we called the 'Original Brat Pack' (Bill Maggard, Bob Martin, Jack Saba, Bob Peabody and Eddie Wright) were a bit younger, they used to play football in the center median on Beale, near the corner of Quincy." 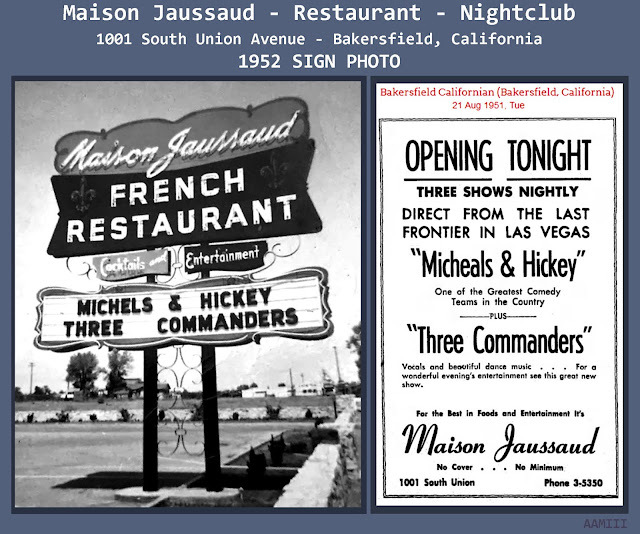 * ... MEMORIES: The recent posts about the elegant old Maison Jaussaud's restaurant triggered this memory from Gary Crabtree: "Along with the Saddle and Sirloin, there used to be another small restaurant called the Crystal Inn, I believe located around South Union and Planz Road. It was a small place with great food and top notch entertainment. 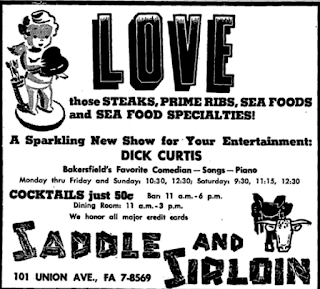 I remember my parents taking me to dinner there for my 10th birthday. The entertainment was a piano player and a female singer named Margaret Whiting who was about to explode on the national recording scene. I’d be interested if anyone else remembers the Crystal Inn." tip each time. I have no idea why they traveled by car and not by air; maybe just to eat lunch at JoSo's." * ... FAMILY TIES: And if you wanted more proof, check out this note from Gary Jaussaud, son of one of the brothers that founded Maison Jaussaud's. "I can tell you first had, in fact the Shah of Iran and his group did in fact have lunch at Maison Jaussaud’s during that period of time. I remember because I was there and saw it with my own eyes. Two things I remember the most is, once our chef found out they were coming he went out and bought all kinds of interesting items they might like, and when it was said and done, the Shah wanted an American hamburger. The second thing was, the U.S. security team with the group, paid for the lunch with a federal check, as the Shah was the guest of the United States. The event realty happened, so you can tell your readers, you got the information from the source." * ... MORE MAISON: And Hank Webb chimed in with this memory: "I was home on leave from the Navy wherein I was a navy hospital corpsman. 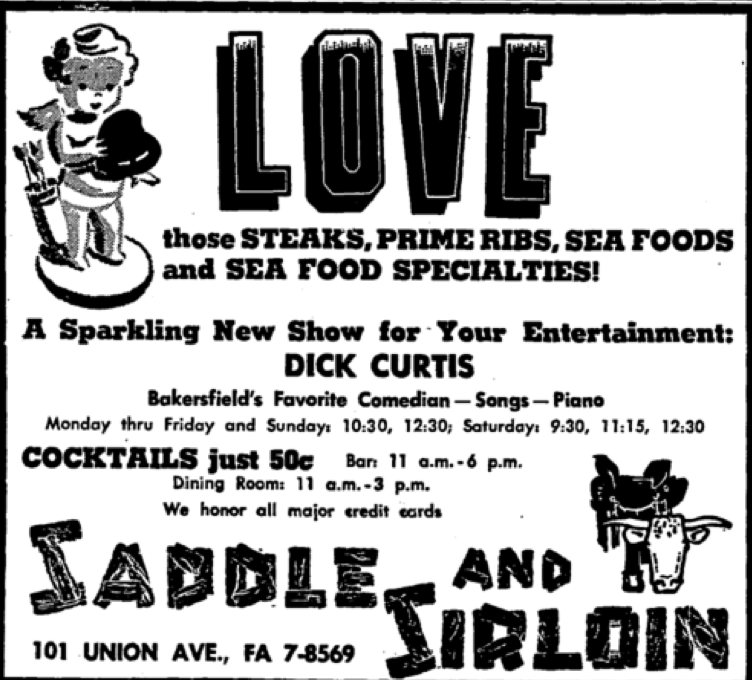 As a treat for my 21st birthday, my brother-in-law, Denny Haynes, who was later finance director for the city of Bakersfield, my sister Elizabeth, and my mother Benita took me to Jaussuad's to see Sally Rand, the world famous 'fan dancer.' She was an ecdysiast, aka a stripper, who used two huge ostrich feather fans in her act. At one point Ms. Rand exposed larger quantities of her physique than my mother could tolerate, so she tried to put her hands over my eyes and cried out, 'Oh don't look! "'I calmly replied, 'It's ok momma, I'm a medical man.' Thus making me one of my family's enduring jokes."